Inscriptions come in many different languages: Welsh, Scottish Gaelic, Danish, Africaans, Maori and Zulu to name the ones I’ve come across. The language usually reflects the casualty’s country of origin, even if he was no longer living there when he died. The War Graves Commission stipulated that “Inscriptions requiring the use of special alphabets such as Greek, etc, cannot be accepted”, but despite this there are apparently some Hebrew inscriptions. And there is one famous example where the inscription is a musical notation, which no one has convincingly been able to decipher. 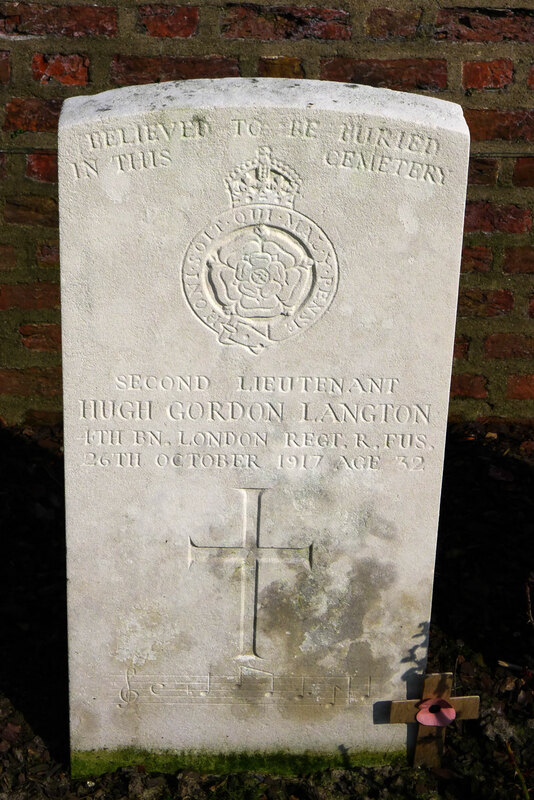 The casualty here, Hugh Gordon Langton, was a concert violinist. I have an article on Canadian epitaphs of the Great War which I would like to send to you. Do you have an email address where I could send it as an attachment? Congratulations on the appearance of your book — very timely and moving. I am delighted to hear from you. I have read your excellent article, ‘Approaches to Canadian Epitaphs of the Great War’, online and rather hope that my work is making a small contribution to the comment you make at the end about “excavating … down to the foundation of the epitaphs, unearthing clues to the reasons behind their choice and setting them firmly in the cultural context of their time …”. I have drawn other people’s attention to your article as it really is one of the most interesting pieces on the subject. Have you read Sonia Batten’s PhD thesis on Memorial Text Narratives in Britain 1890-1930. It too is online. I will send you my email address as I should be happy to hear rom you again.